Here is a brief selection of the many books written or edited by Cathy Malchiodi, PhD; you can also find translations in Korean, Chinese, Greek, Italian, Hungarian, Russian, Turkish, Hebrew, Japanese, and more. Check back soon for information on new titles! 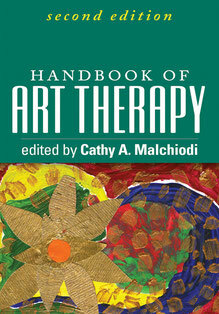 Find more books on art therapy or expressive therapies visit Guilford Publications or Cathy Malchiodi’s Amazon Author Page. 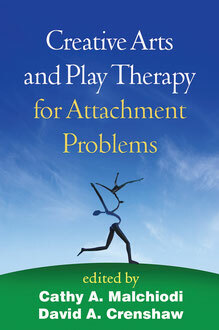 Creative Arts and Play Therapy for Attachment Problems (Guilford Press, 2013). This book vividly shows how creative arts and play therapy can help children recover from experiences of disrupted or insecure attachment. Leading practitioners explore the impact of early relationship difficulties on children’s emotions and behavior. Rich case material brings to life a range of therapeutic approaches that utilize art, music, movement, drama, creative writing, and play. The volume covers ways to address attachment issues with individuals of different ages, as well as their caregivers. Chapters clearly explain the various techniques and present applications for specific populations, including complex trauma survivors. To read more and download a sample, please follow this link. 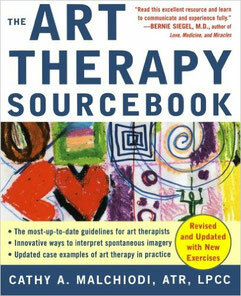 If you are looking for an introduction to art therapy-- The Art Therapy Sourcebook (McGraw-Hill). This book will provide you with an overview of the field of art therapy and explain power of art making for personal growth, insight, and transformation. It will introduce you to what art therapy is, where is came from, and why it is a powerful way of knowing yourself and an equally powerful way of healing. It will also familiarize you with some of the many ways art making as therapy can help you authentically express yourself, reduce stress, confront and resolve trauma or loss, and enhance your health and well-being. What makes mankind unique is not our ability to reason but our use of symbols. Read this excellent resource and learn to communicate and experience life fully. — Bernie Siegel, MD. 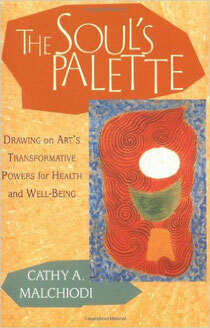 Are you a professional or student looking for a comprehensive book on the field of art therapy? Or are you studying for the Art Therapy Board Certification Exam? This is the text for you– used by new professionals to review the major principles of the field of art therapy when preparing to take the board certification examination. This essential handbook provides a complete and practical overview of art therapy: how it works, how it can be used, and with whom. Demonstrated are interventions for children, adolescents, and adults facing a variety of clinical problems and life challenges. Case-based chapters from leading practitioners illuminate major theoretical perspectives, including psychoanalytic, cognitive-behavioral, developmental, and other approaches. Also examined is what current research in psychology and neuroscience can tell us about the scientific basis for art therapy. Discussing applications in individual psychotherapy, couple and family treatment, and group work, the Handbook includes over 100 samples of drawings and other artwork. The process of art therapy is illustrated in helping clients manage and cope with such problems as trauma, sexual abuse, developmental and learning disabilities, drug and alcohol issues, serious mental illness, and medical illness. Handbook of Art Therapy, Second Edition adds new information on posttraumatic stress disorder, domestic violence, creativity and aging, materials and media [including digital art therapy], and professional issues including practice, research and cultural aspects. 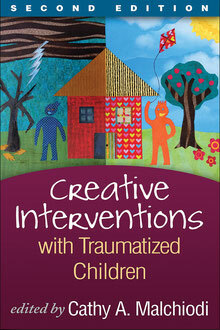 Creative Interventions with Traumatized Children (Guilford Press)– Best Seller! Creative Interventions with Traumatized Children is rich with case material and artwork samples; this volume demonstrates a range of creative approaches for facilitating children’s emotional reparation and recovery from trauma. Contributors include experienced practitioners of play, art, music, movement and drama therapies, bibliotherapy, and integrative therapies, who describe step-by-step strategies for working with individual children, families, and groups. The case-based format makes the book especially practical and user-friendly. Specific types of stressful experiences addressed include parental loss, child abuse, accidents, family violence, bullying, and mass trauma. Broader approaches to promoting resilience and preventing posttraumatic problems in children at risk are also presented. 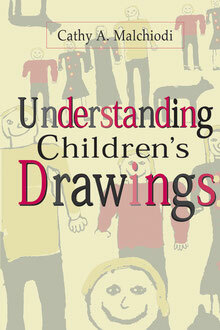 Understanding Children's Drawings (Guilford Press)-- Bestseller! This best selling, practical resource demonstrates how all clinicians can broaden and enhance their work with children by integrating drawing into therapy. The book enables therapists to address the multidimensional aspects of children’s art without resorting to simplistic explanations. Approaching drawing as a springboard for communication and change, this book offers a wealth of guidelines for understanding the intricate messages embedded in children’s drawings and in the artmaking process itself. Topics covered include how to assist children in making art, what questions to ask and when, and how to motivate children who are initially resistant to drawing. Assimilating extensive research and clinical experience, the book includes over 100 examples of children’s work. For more information, click here! Making art may be as important to your physical and spiritual health as balanced nutrition, regular exercise, or meditation. Expressing yourself creatively—through drawing, painting, sculpture, photography—allows you to tap into a source of inner wisdom that provides guidance, soothes emotional pain, and revitalizes your being. The Soul’s Palette reveals art’s transformative powers. Exercises include working with materials for drawing, painting, sculpting, and collage; simple drawing and journal projects; self-guided meditations and affirmations; ideas for cultivating intuition, inspiration, and spontaneity; exploring personal symbols; and making art a spiritual practice. “Cathy Malchiodi is a modern-day medicine woman who knows the cure is within. The Soul’s Palette is like an eye-opening journey to the Grand Canyon of creativity and healing in the company of a seasoned guide.”—Jan Phillips, author of Marry Your Muse, God Is at Eye Level, and Making Peace. 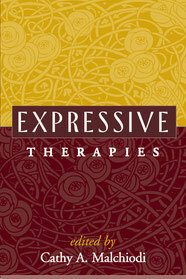 Also available…the classic Expressive Therapies, Guilford Press. Psychotherapists, counselors, and other health care professionals are increasingly turning to expressive therapies–including art, music, dance/movement, drama, poetry, play, sandtray, and integrative approaches–in their work with clients of all ages. This timely volume offers a comprehensive presentation of these innovative and powerful modalities. Expert contributors present in-depth descriptions of their respective approaches to intervention with children, adults, and groups, giving particular attention to strategies for integrating expressive work with other forms of psychotherapy. You can find out more about the Creative Arts and Play Therapy Series by clicking this link.